When most of us think of multifunctional kitchenware, we think of those small appliances that come with a plug. 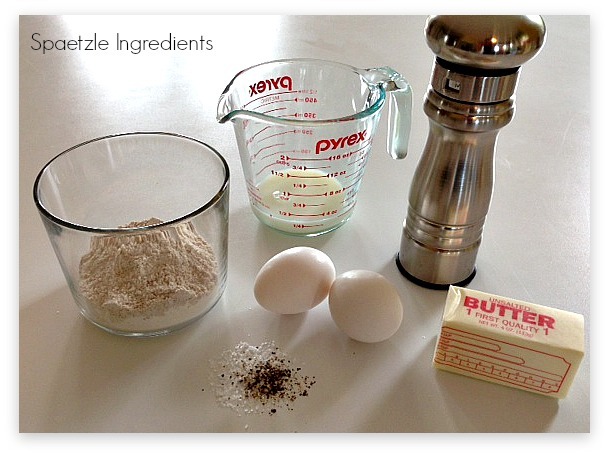 I use my food processor for everything from chopping vegetables to making dough. I use my electric pressure cooker for sautéing veggies, pressure-cooking beans and for making soup. I use my slow cooker for roasts, casseroles, and keeping mulled wine at perfect temperature for a party. And my professional-grade blender serves up everything from smoothies to freshly ground spices. But, beyond the multifunctional electric appliances, my kitchen is filled with a few essential pieces of cookware and bakeware. In particular, one of my favorites is my oven-to-table ware — a white, porcelain, fluted baker. Yes, it’s a basic baker, no bells and whistles, but it’s utility outshines many of my high-end plugged-in tools in the kitchen. The reason is simple: It cooks just about everything, saves me time, and is pretty stylish too. One of the main benefits of using oven-to-table ware is its utility. One dish goes from freezer to fridge, and from oven (or microwave) to the table. Perfect for use all year round, these pieces are particularly handy during the holiday season, and are ideal for everything from breakfast, lunch and dinner (Chicken Pot Pie), to appetizers, side dishes (Corn Bread, Wild Mushroom and Pecan Stuffing) and desserts (Parisian Apple Crisp). My oven-to-table ware is perfect for hectic evenings, casual or formal parties, or for delicious appetizers for game-time. I often pre-make meals, and store them in the freezer until ready to use. If, by chance, there are leftovers, I slip the baker in the fridge, until we’re ready to eat again – when I reheat in the same piece, in either the oven or the microwave. Another coveted benefit of using my oven-to-table ware is the idea of having fewer dishes to clean. One pot, from freezer to oven to table – is a welcomed choice especially in our home (we don’t have a dishwasher!) Made to last a lifetime, the porcelain oven to table bakers are easily cleaned by hand with soap and water, or in the dishwasher. Oven-to-table ware comes in all shapes and sizes. It’s best to have several different sizes on hand – some can be single serve, others big enough for a party, and still others sized perfectly for those family one-pot meals. As for styling, I opt for a classic white. Sure, matching patterned pieces are fun to have, but the classic white glaze with its decorative fluted edges takes me through the seasons, and looks great whenever, or wherever, I use it – from casual everyday occasions to the formal dinner parties. An easy deep-dish pizza with a thick and crunchy cornmeal crust. It takes a total of 1 ¼ hours to prepare, most of which is the crust-baking time. The recipe yields 1, 10-inch pie, which serves four. We like to substitute our favorite vegetables, or those we have currently available. Also, at times we skip the tomato slices and add a bit of tomato sauce instead. Combine cornmeal, salt, and cold water in a small bowl. Have the boiling water on the stove in a saucepan, and add the cornmeal mixture, whisking. Cook about 10 minutes over low heat, stirring frequently. It will get very thick. Remove from heat, and let cool until it can be handled. Preheat oven to 275 degrees F. Oil a 10-inch pie pan or baker. Add the polenta, and use a spatula and wet hands to form it into a smooth, thick crust over the bottom and the sides of the pan. Brush the surface with olive oil, and bake uncovered for 45 minutes. While the crust bakes, heat 1 tbsp olive oil in a medium-sized skillet. Add the onion, and sauté for 5-8 minutes, or until it begins to soften. Add bell pepper, mushrooms, and zucchini, and sauté until everything is tender. Stir in the garlic and herbs, and sauté just a few minutes more. Turn up the oven to broiling temperature. Sprinkle half the cheese onto the bottom of the baked crust, then add the tomato slices. Spread the sautéed mixture over the tomatoes, and sprinkle the remaining cheese on top. Broil until brown (about 5 minutes), and serve hot. Laura Everage is a writer, editor, swimmer, yoga-lover, wife, and mother of four. Her days start very early in the morning, but thanks to her favorite beverage, coffee, she is able to start each day on a good note. Laura began her journey in all things food and beverage related nearly 20 years ago, as Managing Editor of The Gourmet Retailer. She continues to write about food, coffee, tea and kitchenware and is currently working on a book entitled Courage in a Cup: Women, Coffee and the Global Economy. Laura is also founder and editor of her own website, Family Eats, and is editorial director/partner of Coffee Universe.Her work has appeared in a variety of trade magazines as well as consumer publications Saveur and Consumers’ Digest. Laura’s knowledge of the industry has landed her appearances on both the Food Network and Fine Living Network. To contact Laura, email Laura@familyeats.net. This entry was posted in Cook - Recipes from Friends and tagged Baking Tools, HIC Oven-To-Table Porcelain, Laura Everage, one dish meals, Sweets, Tools Exclusively from HIC Harold Import Co. on February 2, 2014 by Laura Everage. Spätzle, as my Grandma Esther would spell it, loosely means “little sparrow” and gets it’s name from a time before kitchen tools like spaetzle makers, or “hobels” as they’re also known, were readily available. Historically it was shaped by hand with a spoon or knife and was thought to resemble small birds. Spaetzle is the base of many dishes in a cookbook my Grandma presented to me on my 16th birthday; A fantastic compilation of family photographs spanning 5 generations, rustic recipes laden with meat and starchy vegetables meant to feed a large farming family, ingredient lists calling for everything from goat’s milk to “Aunt Edna’s canned pears,” plenty of spaetzle, and clippings from newspapers and magazines that had significance to my Grandmother either culinary or personal. This book is a time capsule and I smile every time I go through it. 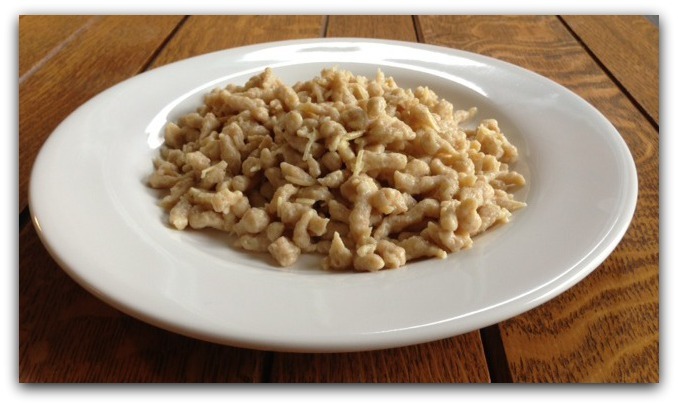 Spaetzle is traditionally used as a base for both sweet and savory dishes, soups, and one-dish meals, as it is in my family cookbook. 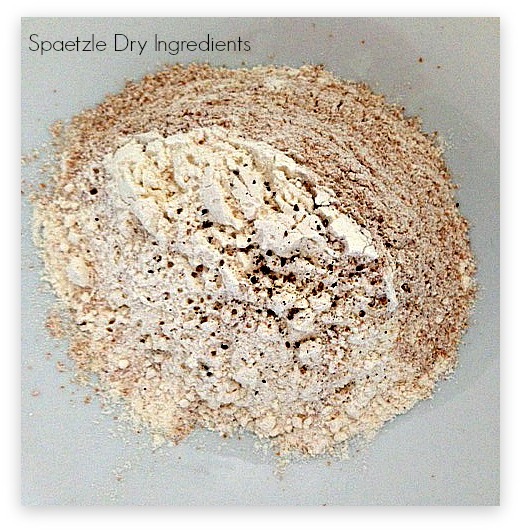 It’s inexpensive, filling, and can be modified to please a variety of palates. I’ve attempted every recipe in Grandma’s cookbook including spaetzle with cherry sauce made with Grandma next to me, others like squash pie made along side my dad, and the one I’m sharing here – Käse or Light Cheese Spaetzle – I make for my family. Grandma Esther left a sweet message in the book, noting, “Dear Nee Nee, some of the dishes may not be so practical for modern times (Maybe she was thinking of the kidney pie? My ancestors didn’t waste a bit.) I hope you find a few that you can enjoy.” And I have. 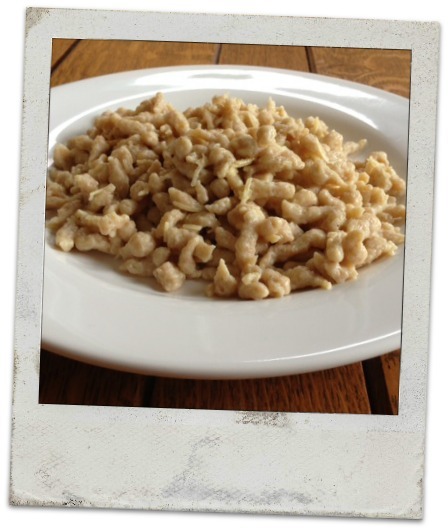 The flavor and texture of spaetzle is comforting, and brings warm feelings of nostalgia. It’s quick to whip together for guests, plus one batch of noodles can be topped a variety of ways to suit everyone around the table. I hope you might enjoy it too. ½ cup grated cheese (my Grandmother used Emmentaler, a harder German cheese) Here is a great website with a guide to German cheeses, for your perusal. Tools: Spaetzle Maker or Hobel. Visit HIC’s “Where to Buy” page to find one at a kitchen shop near you. Combine the flour, salt and pepper. 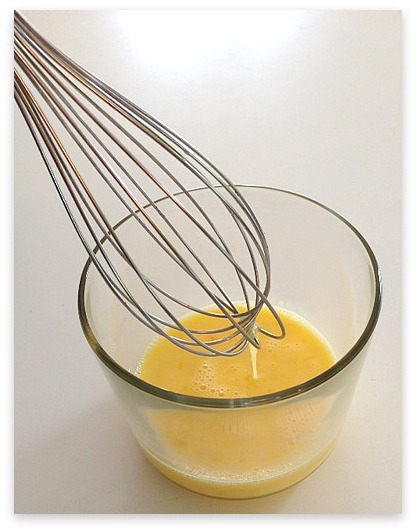 In a second bowl, whisk the eggs and then add in the milk. Create a depression in the center of the flour mixture and pour in the wet ingredients. 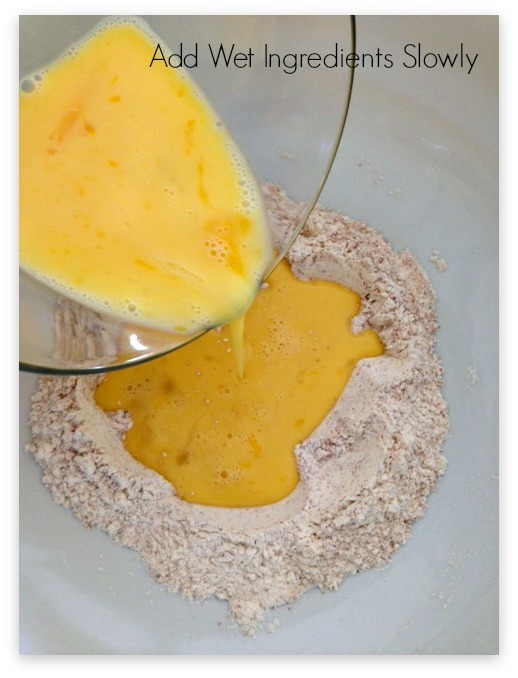 The flour should be added and blended gently and slowly, scraping from the sides of the bowl, until well combined. Bring a pot of lightly salted water to a boil, and then reduce to a simmer. Make sure the pot is wide enough to allow for the spaetzle maker to sit on top, if using this device. 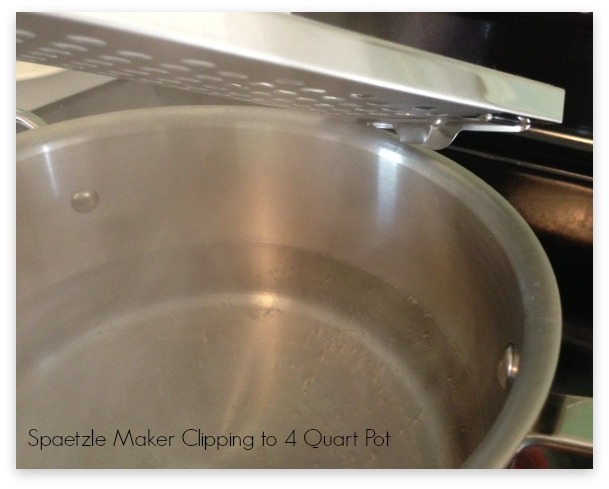 Place the spaetzle maker over the pot, and clip to one edge. Fill the hopper with a ball of dough, filling it to the top. Slide the hopper across, and watch the dough fall through the holes, into the simmering pot below! Do this in batches so you don’t get a thick layer of spaetzle accumulating, which can clump together. With this size recipe, and using a 4 quart pot, I found I don’t have to do batches, I can make all the spaetzle at once and there’s enough surface area on the top of the pot to deter clumping. 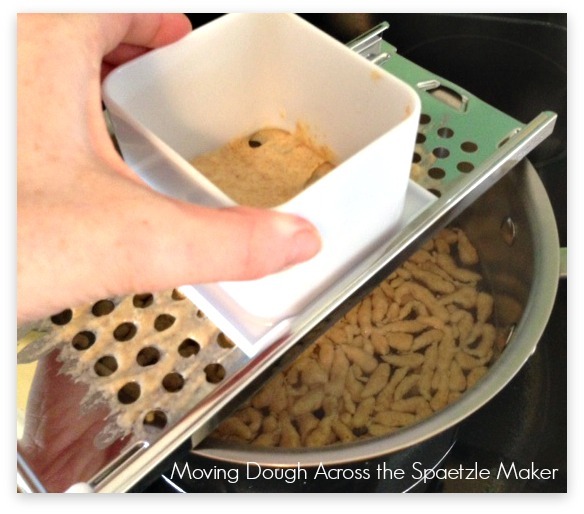 This dough recipe fills the hoper of the spaetzle maker exactly once. 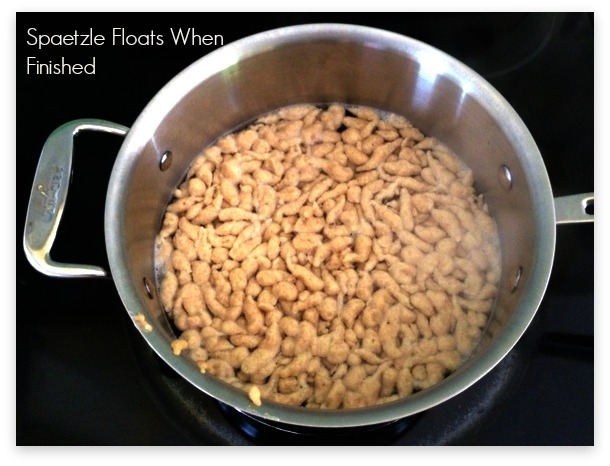 You know the spaetzle is done, when it floats to the surface of the pot. Stir it gently to prevent it from sticking. Remove the finished spaetzle noodles form the pot with a slotted spoon or dump the whole pot into a smooth surface colander (not a mesh strainer, I find it sticks to the mesh) and give it a light rinse of cold water. Place the rinsed spaetzle into a bowl with sides high enough to permit tossing, and drop the 2 pats of butter on top. The heat of the spaetzle will melt the butter. Stir in. Sprinkle the cheese into the bowl as well, and stir to combine with the buttered spaetzle. Dish into smaller bowls, and add a little more salt and pepper to taste, if desired. (Or, more cheese on top.) Dig in! This entry was posted in Cook - Recipes from Friends, Useful Tools and tagged one dish meals, Pasta, Pasta Tools, recipes, rustic recipes, spaetzle, Swabian food, Tools Exclusively from HIC Harold Import Co., useful tools on June 21, 2013 by HIC, Harold Import Co..